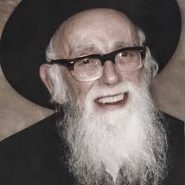 A brokenhearted widow with several young children once came to the great Rabbi Shlomo Zalman Auerbach. This young widow told Rabbi Shlomo Zalman that she feared that she was to blame for her husband’s death, because of something she might have done wrong. And she had decided that she wanted to take upon herself something requiring great mesirut nefesh (self-sacrifice and effort) in her husband’s memory. The young widow, it seemed, had in mind something like fasting every Monday and Thursday or scrubbing the yeshiva floors every week before Shabbat. “My dear daughter, I hear that you want to do something requiring great mesirut nefesh? “Go and buy some toys for your children. “Try to take your children to the playground at least once a week. The widow’s eyes went wide with surprise. And then a hint of a smile blessed her lips, for the first time in a very long time, as well.